My business partner and I recently met with an accountant. The accountant raved about our business concept of opening a wellness center offering acupuncture, yoga and more. He said he became a believer in natural medicine when he started going to a chiropractor about 10 years ago, and now every time his busiest time of work, tax season, rolls around, he prevents his usual onslaught of stress-induced headaches by going to his chiropractor and using self care techniques at home. That’s exactly what it’s all about: finding ease in your life - finding ways to relax - even in the midst of tense situations. Our accountant illustrated perfectly the goal of our future wellness center: we want to offer all kinds of ways for people to relax and be peaceful in their body, no matter what. That “no matter what” part is the key. It’s easy to relax at home after work on the couch, or on a Sunday afternoon in the sunshine. The question is, can you relax and be peaceful in your body in the middle of an important meeting, as you’re giving a presentation, in the midst of driving in traffic, in the heat of an argument with your partner? Cortisol is killing us. Cortisol is what skyrockets in our bodies when we are stressed out. When cortisol increases, our normal life-giving functions like breathing, digesting, eliminating or even reproducing get put on the back burner because our bodies are stuck in survival mode. Tension not only restricts normal functioning, it’s contagious. Think about the last time a co-worker stormed into the office, or sent you an email in all caps. Or when your partner came home from work all-a-grump. How did that feel to you? When you choose -consciously or unconsciously- to hold on to a constant state of stress, it’s the same as walking around with a highly contagious virus and you’re sneezing it onto everyone you come in contact with. Ew. I’ve got my own tension to let go of; can you please be responsible for your own damn tension and cover your mouth at least? I’m practicing this concept of relaxing no matter what. I’m finding there are a few times during the day when it is appropriate to be tense. A few. 90% of the rest of the day goes smoother, for my own body and for those around me, when I relax. 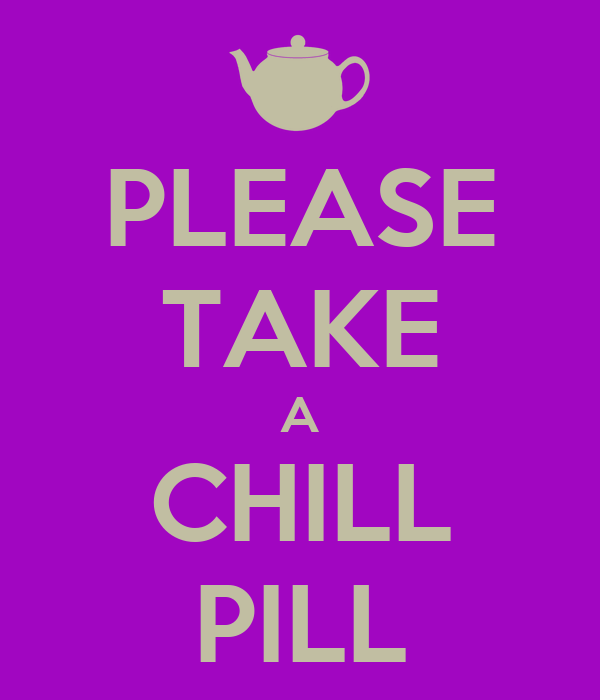 I’m working on taking my own junior high advice and ‘take a chill pill’.